DOS OSOS TIMBER WORKS, INC. Welcome to Dos Osos Timber Works, Inc. Thank you for visiting the Dos Osos Timberworks web site. Here you can learn more about us and our crew, view our diverse portfolio, and learn more about the art of timber frame design and construction. With decades of experience designing and building homes on the Central Coast of California, we have an established track record of producing fine timber frame homes and executing installations as subcontractors. We are truly a design-build firm in that we can take the process from beginning to end to streamline the budget and timeline, and do so often. This means that we can meet your planning and permitting needs from LEED certification to Minor Use Permits in sensitive habitats as well as the construction of your job, and everything in between. Members of the Timber Framers Guild and anyone looking for a turnkey residential contractor, please take the time to visit the rest of the site and contact us with any questions you may have. 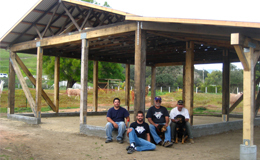 A previous client, and good friend of ours contacted us to build a llama barn for his property in the south county. We were happy to oblige and had a lot of fun on the project. The crew near completion of the job! © Copyright 2011 Dos Osos Timber Works, Inc. 2112 9th St. • Los Osos, CA • 93402 All rights reserved. Site designed by Webeclectic.com.